The United States announced Monday it was lifting its ban on refugees from 11 “high-risk” countries, but said those seeking to enter the US would come under much tougher scrutiny than in the past. Applicants from 11 countries, unnamed but understood to include 10 Muslim-majority nations plus North Korea, will face tougher “risk-based” assessments to be accepted. 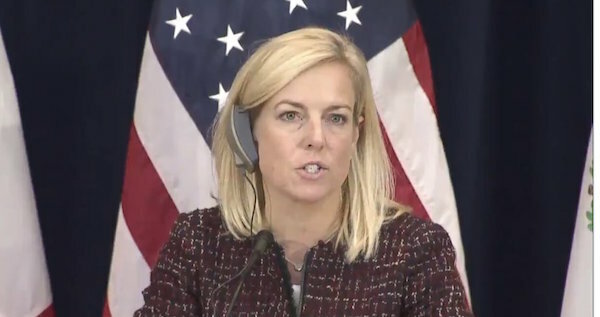 “It’s critically important that we know who is entering the United States,” said Homeland Security Secretary Kirstjen Nielsen. The 11 countries, hit with a ban in October in the Trump administration’s revised refugee policy, have not been identified officially. But refugee groups say they comprise Egypt, Iran, Iraq, Libya, Mali, North Korea, Somalia, South Sudan, Sudan, Syria and Yemen. Speaking anonymously, a senior administration official told journalists that the policy of enhanced security assessments for the 11 countries was not designed to target Muslims. “Our admissions have nothing to do with religion,” the official said, adding that there is “nothing especially novel” about tougher screening for countries deemed to have a higher level of risk. Donald Trump has pursued a much tougher stance on immigrants and refugees from all countries since becoming president one year ago. His predecessor Barack Obama set refugee admission in fiscal 2017, which began on October 2016, at 110,000. When Trump took office a year ago, he slashed that to 53,000, a number that was cut again to a maximum of 45,000 in fiscal 2018. But refugee arrivals this year could come in significantly lower than that, due to the backlog from the 120-day halt and a slowdown in processing because of generally tougher applicant reviews. DHS would not explain what the tougher vetting measures for the 11 countries would include. But all applicants are being asked to supply more detailed histories and evidence of their past activities, and many are having to allow access to personal electronics and social media accounts. The move comes as Trump presses for a sharp turn in overall US immigration policy that critics say will result in a 50 percent cut in arrivals each year and bias admissions away from African, Asian and Muslim countries. Last week, Trump proposed to end the 27-year-old “green card lottery” program that aims to diversify the source of immigrants, leading to an upturn in those from Middle Eastern and African countries. He also proposed to tightly limit the family members who can join immigrants to only spouses and younger children. Until now, such “chain migration” could extend to immigrants’ parents, grandparents, siblings and extended family. The White House said the policy was necessary to protect national security from terror and crime threats. In return, Trump proposed a plan that offers 1.8 million young unauthorized immigrants known as “Dreamers” a path to citizenship over 10-12 years. Democrats and Republicans are starting negotiations on those proposals, along with Trump’s request for a $25 billion “trust fund” to build a wall on the southern US border to deter illegal border-crossers from Mexico.